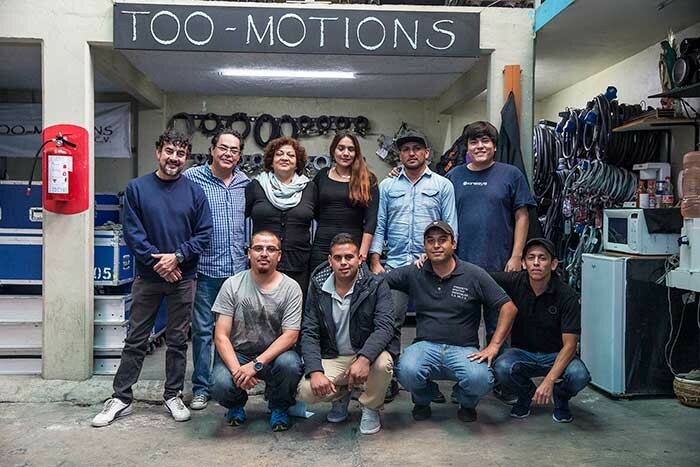 Mexico – Too Motions is a family-run entertainment industry automation and motion control specialist based in Mexico City which has invested heavily in Kinesys products. Currently they are the only enterprise in the county offering a full rental service in this specialist field to a wide variety of clients in the worlds of corporate activations, music concerts and tours. Like many people in Mexico where music is such a huge part of the culture, the pair originally got into show business through Hector’s Junior High School band Steel Hawk. He played guitar and Gustavo started doing pyrotechnics. Back then they had lots of fun and big dreams, and never really imagined that ‘production’ would become their business, let alone such a success. Gustavo’s career as a pyrotechnic designer and firer to the stars took off. It was all quite improvised back in the 1990s as it was extremely difficult to import explosives into Mexico, but his reputation and contacts in the music industry spread and 15 years ago, he formalised all this knowledge and experience with the founding of Pyrofetti, which is run from the same warehouse as Too Motions in Satélite, a suburb of Greater Mexico City. Gustavo’s experience, business acumen and vision have assisted in helping him pre-empt a few industry trends over the years and this is what led him to set up Too Motions in 2011 initially as a specialist rigging venture. Very soon, he realised that they needed to make an investment in automation. Watching international productions, he could see the huge potential of automation as another visual element of show design. As more world tours visited Mexico routinely he saw a big gap in the market. They would often utilise their B or C rigs in Mexico because specialist technical kit or skills like automation could not be sourced. While there were many audio, lighting and video companies out there in Mexico, no-one specialising in automation, and up to that point, when tours or concerts wanted something to move, it tended to be a manual operation. They pooled all the money they made from an eight-month tour celebrating the bicentennial of Mexican independence in 2010 and invested it in the first Kinesys elements the following year. That purchase comprised eight Liftket motors and eight Elevation 1+ drive units, Vector control and a PD-ES power distribution and emergency stop control. This was followed by on-site training by a team sent over from Kinesys in the UK so Too Motions own crew could become fully acquainted with the system and train up their own crew and automation specialists from there. There have been other training sessions since with Kinesys in a rented space in Mexico City to allow crew to work on full rigs, and then to ensure that more crew can become automation specialists. Their first gig was with Mexican singer and superstar Emmanuel. When they initially explained to the client what the Kinesys system was and its capabilities they immediately encouraged them to buy more, and four more sets of Liftkets and Elevation 1+s followed the following year for further Emmanuel shows. “I remember the reactions on that first tour where we were moving three trussing pods,and people were just completely blown away with the grace and precision of the system, they had never seen anything like it,” comments Hector. Word soon spread and business started to expand. Too Motions now has 24 axes of Kinesys Elevation 1+ movement, two vector controllers, three PD-ES units and five Kinesys beam trolleys, several fully trained crew and are doing between 40 and 50 automation projects a year, mainly in Mexico, but also in a few other Latam countries like Colombia. Recent Kinesys projects have included touring with Argentinian ska band Los Fabulosos Cadillacs, supplying automation for a David Guetta gig in Bogota Colombia, a system was part of the Guns ‘n’ Roses show at the Foro Sol in Mexico City and at the same venue they lifted and moved a mirrored VW Beetle for local rockers and heroes, Café Tacvba. Beam trolleys were supplied to a Huawei event in Cancun and also for the 66th FIFA Congress this year, staged in the Auditorio Nacional in CDMX. Gustavo’s sister Norma takes care of accounts and office management, and his son Edwin has come on-board as a management trainee and 12-year-old nephew Santiago Alonso is also keen to join the action and the business in a couple of years’ time. Hector still plays in a band and runs a busy recording studio in addition to his role in Too Motions management. The company is also expanding with a new office in Cancun scheduled to open early next year giving easier geographical access for projects all across the country. In picture: Too Motions Team.